This one seems easy, but if you’re wrong, it means you’ll have to repaint or live with something you hate. 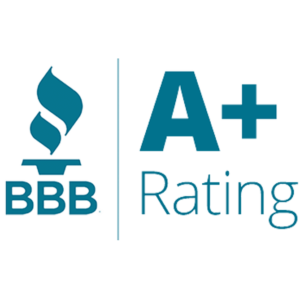 Take into account your wall color, trim color, countertops, backsplash and floors. 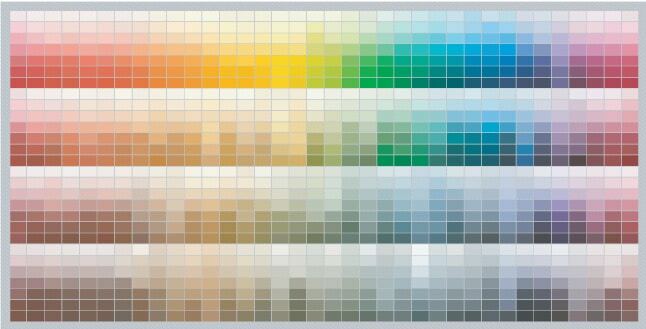 Choose a hue that has an undertone to match. Obviously, if you are doing a second color for an island you’ll need to choose two colors. Color choice is almost limitless. Do not just stop in Lowe’s and grab a gallon of the cheapest paint available and get it mixed to your color. 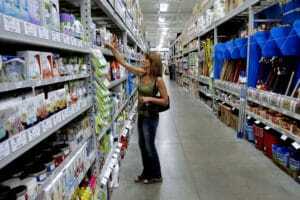 You want to choose a paint that is specifically formulated for cabinets and furniture. I use Benjamin Moore Advance Waterborne Alkyd Paint. Figuring out how much paint you’ll need can be a little tricky, because every job is different. Count how many cabinet doors and drawer fronts you have. If it’s about 30 doors and drawers you are looking at about 1 gallon. Note: this is assuming you’ll be doing it by hand (or using an HVLP system). If you plan on using an airless sprayer you’ll go through about 3-4x the amount of paint. Don’t forget you’ll also want to buy primer while you’re getting your paint. Any high-quality primer will work as long as it’s formulated to adhere to glossy surfaces. 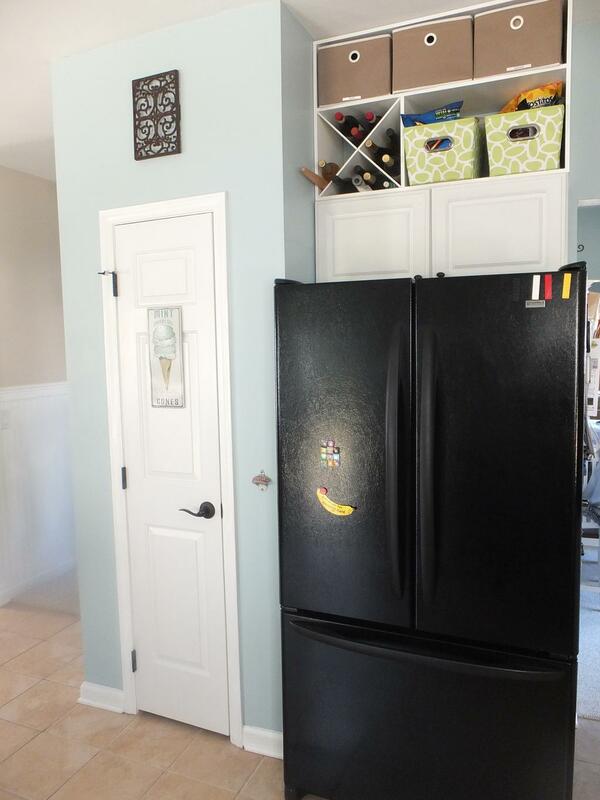 Every kitchen has different size doors, but don’t assume that the doors that are the same size are exactly the same. As I remove doors I label each one in a kind of map so that I can put the same doors back on the same cabinet. What I’ve learned is that installation from door to door can be different and having to drill new holes is a pain in the neck. Although the cabinets are made in a factory, they are installed by a local sub-contractor in the field. 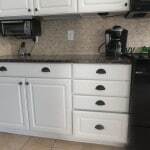 This is especially crucial if you decide you want to paint your island a different color. Once you have a pile of 30 – 60 doors and drawer fronts they all look the same. The older your kitchen cabinets, the more important this is. Don’t loose any of the screws! Save them all in a safe place during removal. 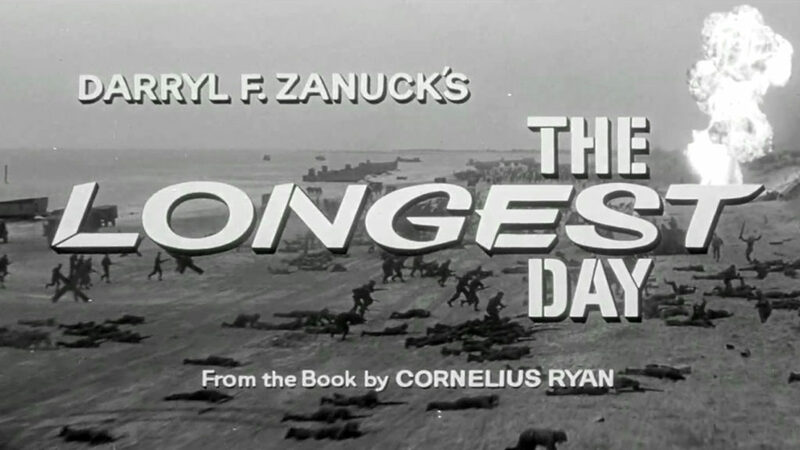 I like to separate them all by type. The first step is to get the gunk off the cabinets. 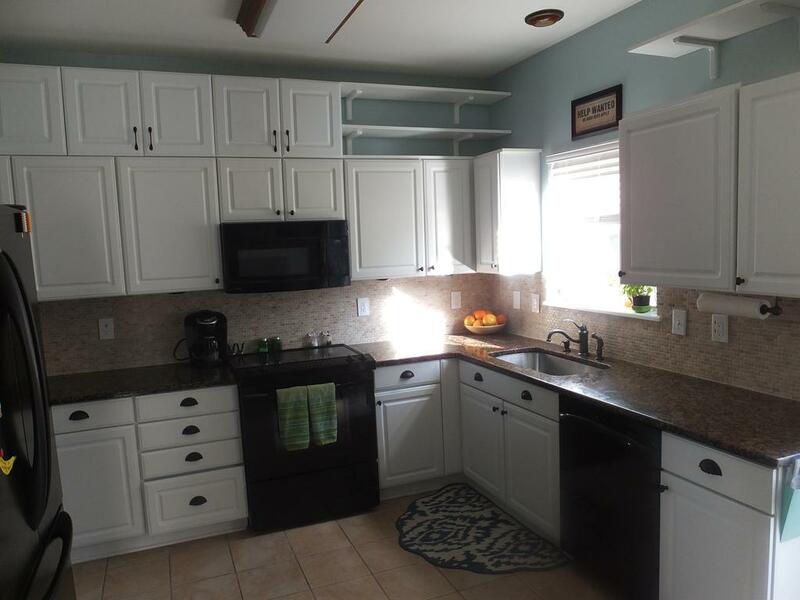 Regardless of your cooking skills and cleanliness, your upper cabinets have attracted grease and dust and your lower ones have been closed by dirty shoes and splattered by mops and pets. You will be surprised once you have them laid out under a harsh light how much cleaning they’ll require. Seriously. You’ll be grossed out. There are dozens of cleaners you can use, but make sure it acts as a de-greaser. 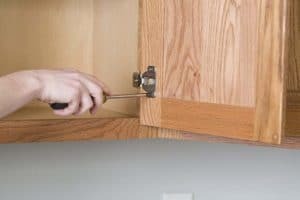 On older cabinets, you may need to employ a flexible putty knife as well. Don’t cut this process short, getting the oils off the surface is the only way to ensure a smooth, consistent finish later. If you leave any grease whatsoever the primer won’t adhere. 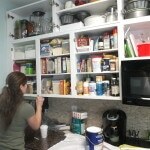 Repeat the process above for the cabinets themselves. 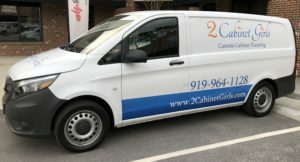 This is also the time to repair any significant dings, cracks, holes, etc. Once the cabinet door or drawer is de-greased you will need to lightly sand with a medium grit (120-150ish) sandpaper to make sure that it is properly prepared to accept the initial coat of primer. This doesn’t need to be excessive, it’s only to rough up the surface a bit and get it ready for the next stage. I use an electric hand sander for the doors and drawers. Lay out the drop cloths that you’ll be using on the countertops and floor in the area you’ll be working if you haven’t already. You should also take time to tape off any hard to reach areas. Painting cabinets means having to reach into some hard-to-reach spots. Prepping first means less clean-up later. Repeat the process above, but don’t use an electric sander on the cabinets that are in place, hand sand those. What I’ve found is that hand sanding keeps the dust created in the kitchen to a minimum. You’ll be kicking yourself if you have to clean sanding dust off all your dishes and glassware, etc. This step does two things in one. It cleans off the sanding residue while also making the cabinet door more receptive to the primer and paint to follow. Makes it extra grippy. That’s a new word I just made up. It’s catchy, no? Grippy….grippy…. Repeat the process above. This is a step that takes time and attention to detail. 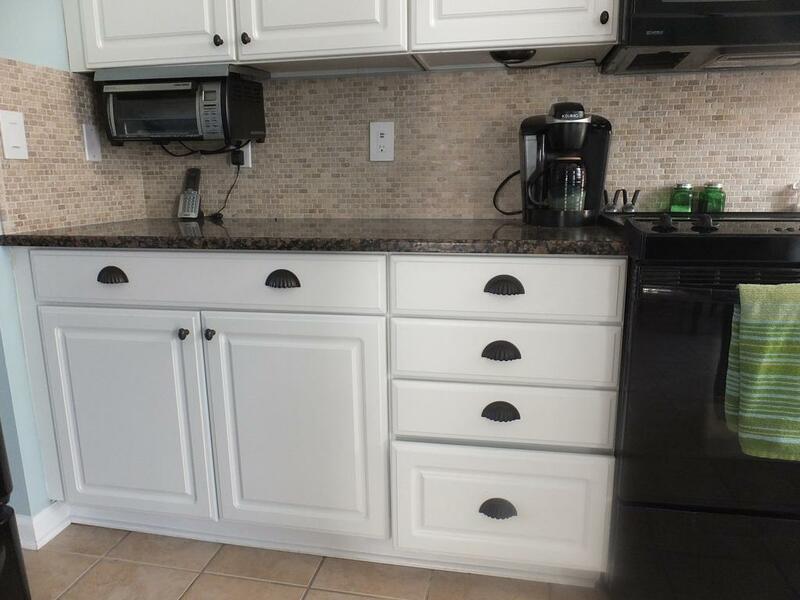 Although the cabinet doors cover 90% of the cabinets, you are always very close to the cabinets when you’re using them, so a misstep here will be noticeable. 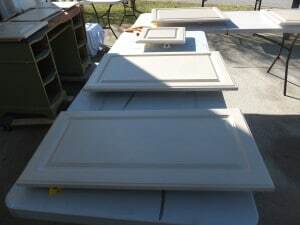 You will need someplace to lay out the doors and drawers to paint them. You’ll need someplace stable, ventilated and if possible, free of flying debris. A good place for a DIY cabinet painter would be the garage (as long as it’s not too hot of too cold). A far distant second is outside in the driveway. 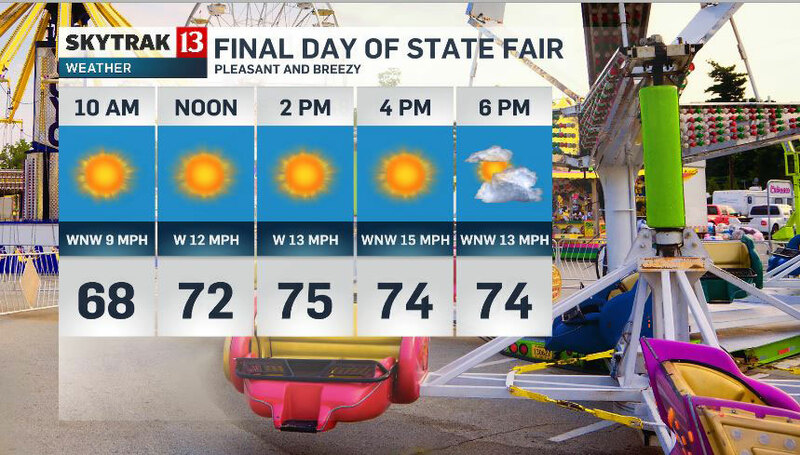 The driveway may seem perfect on a nice day that’s not too hot or cold, but you have people mowing their grass, birds pooping and cars passing by kicking up debris. Keep in mind that your doors and drawers will be out there at least 2 days. At least. 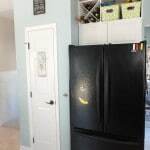 You’ll also want to elevate the doors and drawers so you can paint the edges. Early on I tried everything imaginable trying to find the right method. Finally, I settled on using a small plastic painters pyramid. You’ll need 4 for every door and drawer. 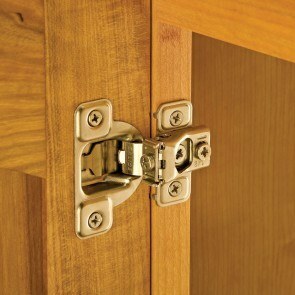 Most modern cabinets utilize European hinges. That means that doors have a circular 35mm hole in them where the hinge fits. The fit in that hole is tight and filling the hole with shellac, primer or paint will make the reinstallation almost impossible. Avoid that problem. Fill those holes with something. Rockler sells special plugs but you can also rig up something else to protect them, putting painters tape in there is better than nothing. If you have oak cabinets, the darkness in the grain can bleed through even 4 coats of primer and paint. To prevent that from happening, you’ll need to arrest the tannins by trapping them in a few coats of spray shellac. It also helps seal the open grain so the primer and paint won’t sink into it. 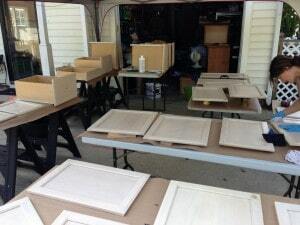 We usually spray the cabinet doors and drawers first with shellac before any paint is applied. This coat doesn’t need to be very heavy, but if you skip it you may not be happy with the final look of your cabinets as time goes by. That grain and its tannins may bleed through if untreated. 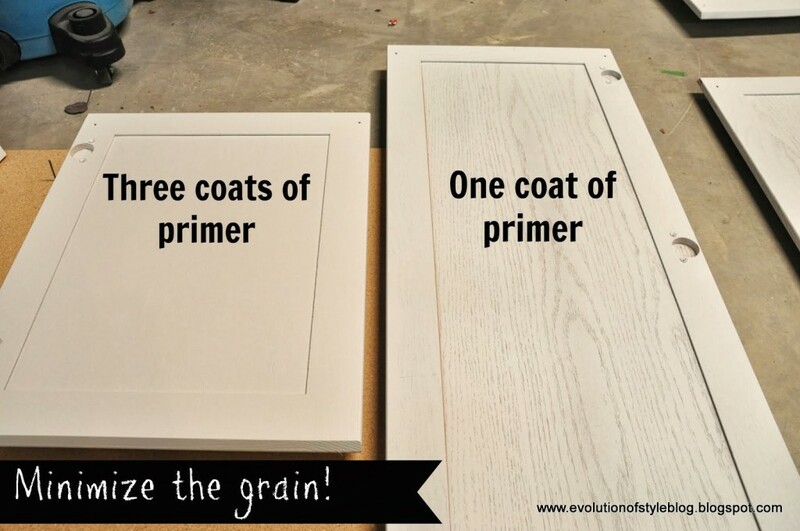 Jenny over at the Evolution of Style blog has a great post about figuring out the best way to paint oak grain. She and I agree that arresting the grain before priming is the smartest way to proceed. You usually don’t have to worry about this step on the cabinets because they’re usually a veneer. The first coat of primer is when you really start to feel like you’re painting your cabinets. Your primer will be white, so unless you’re painting white cabinets, you’ll be able to see the transformation start with a thin first coat. Don’t go super heavy with the primer. Remember that you’ll be applying multiple coats. 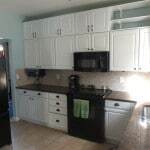 Make sure the cabinets are as opaque as possible before moving on to the paint. For most DIYers we would suggest using a tight foam roller or a mohair roller. Repeat the steps above on the cabinets. Be vigilant to not have any primer build-up at the corners. Drips are a lot of work to sand out. Depending on the conditions you’ll need to wait somewhere between 4 hours and 24 hours for the first coat to be ready for sanding. You need the primer to be completely dry because you’ll be sanding in the next step. Between coats, you’ll need to lightly sand the last coat with a fine grit sandpaper. This is to knock down any of the texture added. Repeat the process above on the cabinets. This seems like a finicky step, but without it, you’ll never get the super smooth factory finish you want. Spend as much time as possible tack clothing all of the sanding debris off the project before applying anything else. With oak doors, this is the stage where you will apply a second coat of shellac to trap the grain and tannins so they’ll never be visible. With the second coat of primer, you should no longer see the original door color. You should have full coverage in preparation of the two coats of paint. Repeat the process above on the cabinets. Take your time here, it’s the foundation of your future cabinets. Another opportunity to take a break for anywhere between 4 hours and 24 hours while you wait for the second coat of primer to dry. This is a good opportunity to start putting away the primer and start getting ready for the real paint. Use a fine sandpaper. I usually use 220 grit. Make sure that you sand away any imperfections left behind from the second coat of primer. Repeat the process above on the cabinets in preparation for the first coat of paint. As I’ve covered before, make sure all the sanding debris needs to be cleaned off and the surfaces pristine. Apply the first coat of paint as smoothly as consistently as possible. Although you’ll be applying 2 coats, the first coat is the base for your final, finish coat. Don’t rush this step. Repeat the process above for the cabinets. Another break of somewhere between 4 and 24 hours while waiting for the paint to dry. Keep in mind that the paint itself can be too cold (below about 50 degrees) or too hot (above 80 degrees). The paint may never cure properly if you’re outside that spectrum. Also keep the humidity level in mind. A 93% humidity level will make waiting for the paint to dry take forever. Continue the process from above making sure the cabinets are perfect and ready for that final coat of paint. This is the place to let your OCD really come out. Any gunk, sandpaper debris or just stuff that was floating around and landed on your surface will be trapped there if you don’t get it off at this step. We always get a brand new tack cloth for this step. You’re almost there! Be as fussy as you can be at this point and apply a smooth final coat of paint to the doors and drawers that you have laid out. 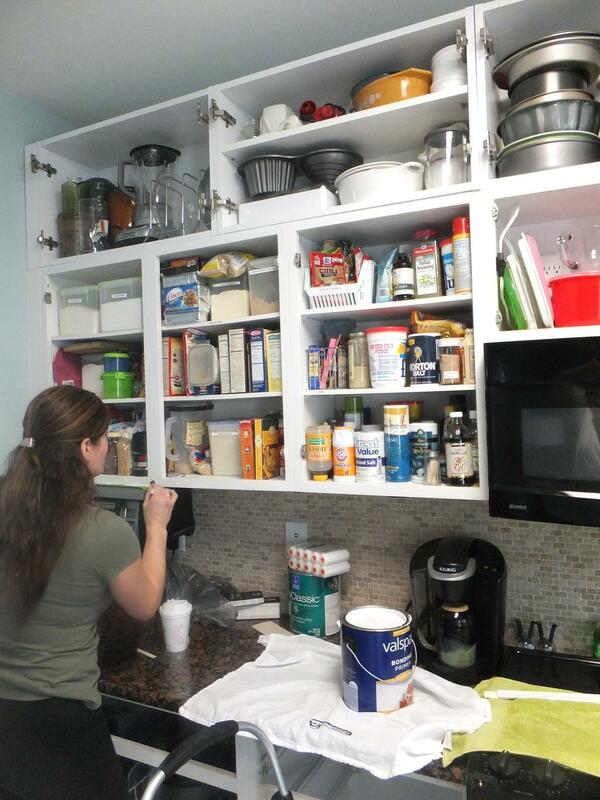 Repeat the process above and apply the final coat of paint to your cabinets. Do whatever is necessary to ensure that you are getting every nook and cranny. Don’t get lazy and allow drips to enter your process now. If you lived in a perfect world, you would wait 30 days to ever touch any of the painted surfaces, that’s when they will be fully cured. But we are only human, so wait at least 24 hours before putting your cabinets back together. This step needs to be planned, methodical and overly cautious. Nothing is worse than having an accident at this point. Dropping a door or nicking a cabinet will make you want to scream. I suggest starting at cabinet 1 and installing door 1 and moving purposefully around the job. Also, I always install new bumpers on the cabinet doors right before I re-install them. Even if you planned well and labeled every door and installed them back in the same place, be prepared to re-adjust the doors. You’ll never look as closely at your cabinet doors as you will now. Doors may have been slightly out of adjustment before and you didn’t notice. 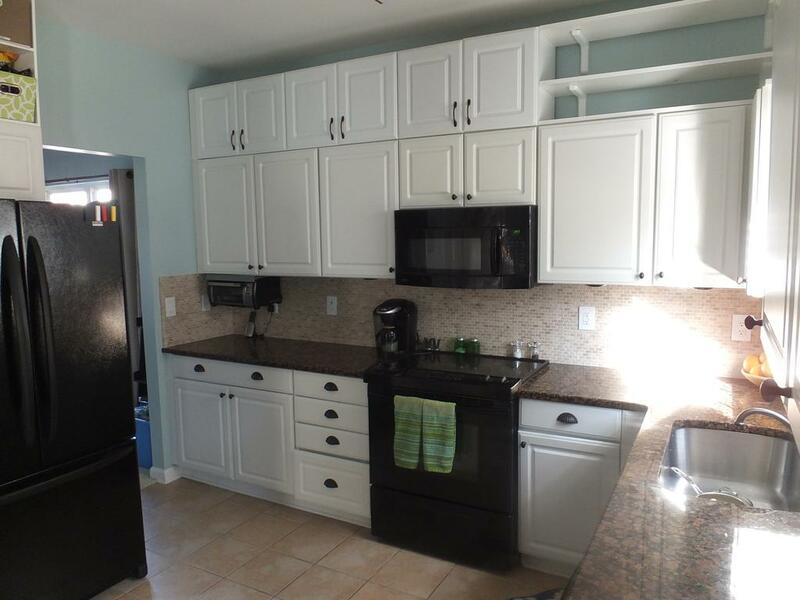 Now sit down and enjoy your freshly updated kitchen! If you’re wondering what the kitchens we work on look like, you can see them in our painted cabinet portfolio. 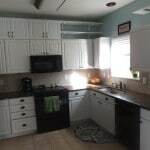 If that seems like too much work, find out in 1 minute how much it would cost to have your kitchen professionally painted. Check related: trusted Northern Lights Exteriors.